ANNAPOLIS, Md. – With their small size, inflatable life jackets keep you cool on a hot day, allow you to freely move around the boat, cast a line or raise sail, and come in a variety of belt and harness styles. While inflatables have a reputation for comfort, they do require a little preparation for the season that’s best done at least a day before your first outing. 1. Open it up and look: Gently open the life jacket, usually by pulling apart any Velcro covers or flaps and then unfold. This thin walled bladder could be the only thing keeping your head above water, so take your time looking for any tears or abrasions. Are the waist strap and any buckles ok? 2. Remove the cartridge: Unscrew the CO2 cartridge and ensure it hasn’t been discharged, sometimes indicated by a small puncture in the center of the threaded end. Check the cartridge and inflation mechanism for corrosion. Some inflator mechanisms have a little “pill” or “bobbin” that dissolves in water allowing for automatic inflation. It should be in good shape. If not, purchasing a rearming kit can solve the problem. Some inflators will have a green ready-to-go indicator. 3. 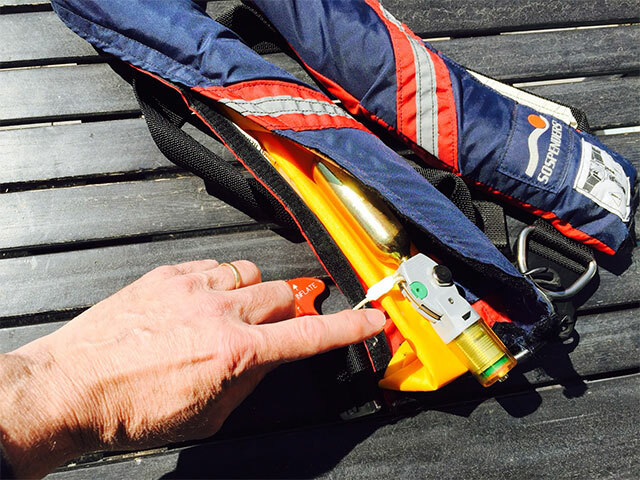 Make like a birthday balloon: Using your mouth, blow up the life jacket using the manual inflation tube which is found on the upper left front of the life jacket. This tube may also be used as a back up to fill the jacket with air, so familiarize yourself on how it works. 4. Go wax the boat, organize a tackle box, or do some other busy work while you leave the fully inflated life jacket alone for 24 hours. 5. If, after the time is up and the life jacket still holds air, deflate and repack according to the instructions which can usually be found on an inside flap. Congrats – you’ve got another comfy and safe season of boating, fishing or sailing ahead of you.If you’d like some help inspecting and repacking belt pack and harness style inflatable life jackets, videos can be found at BoatUS.org/Inflatables. The BoatUS Foundation for Boating Safety and Clean Water is a national leader promoting safe, clean and responsible boating. Funded primarily by donations from the over half-million members of Boat Owners Association of The United States (BoatUS), the non-profit provides innovative educational outreach directly to boaters and anglers with the aim of reducing accidents and fatalities, increasing stewardship of America's waterways and keeping boating safe for all. A range of boating safety courses – including 33 free state courses – can be found at BoatUS.org/courses.